2 1/4" x 4 1/4" x .032" white vinyl plastic. 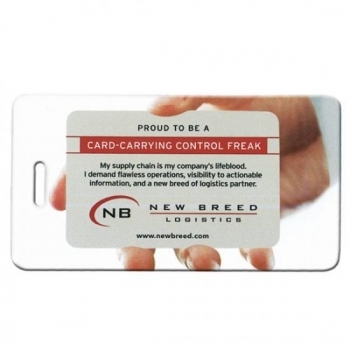 Will hold a standard business card or stock paper ID card (supplied free in bulk). Price includes clear loop straps supplied in bulk. Express version is silk screened 1 or 2 colors and ships 3 days after proof approval. Add $50.00(V) per color plate or screen charge. Minimum purchase 250. Ad copy area: 1 7/8" high x 3 5/16" wide.